The Oklahoma CIty Thunder ended the San Antonio Spurs’ 20 game win streak and climbed back into the series with a convincing 102-82 victory at home in game 3. The Thunder got off to a fast start and never looked back after the second quarter. 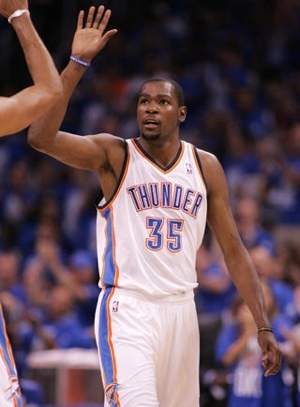 Kevin Durant led the way with 22 points. 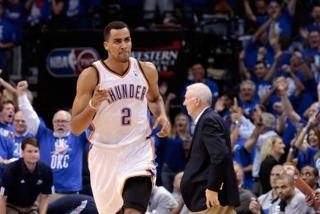 Thabo Sefolosha had his best playoff performance scoring 19 points, and James Harden added 15 points. Tony Parker and Stephen Jackson led the Spurs with 16 points apiece. The Thunder will look to even the series at two games apiece in game 4 Saturday night from Oklahoma City.